The Ferndale Bluff House is a renovated dairy farmhouse on 10 acres with three separate vacation rental suites. The Library Suite and Garden Suite each sleep 2-4, while the Farmhouse Suite sleeps up to 9. Reserve the entire Ferndale Bluff House for up to 20 guests and also enjoy the spacious recreation room and outdoor fire pit - great for family gatherings. Cute, comfortable and clean two-bedroom historic home just steps from Francis Creek and Ferndale's restaurants, bars, shops, playground and bocce courts. Guests enjoy use of the yard and a deck with barbecue and bistro table. 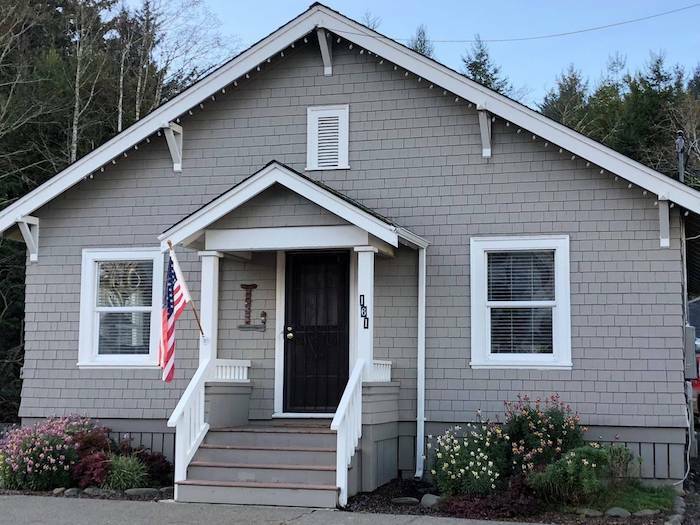 Comfortable and quiet 2 bedroom, 2 bath redwood Craftsman style vacation home with beautiful creekside garden. Sleeps 4-6. Amenities include a full kitchen, dining room, den, deck, satellite TV, DVD/VCR, Wi-fi. Charming 2 bedroom, 1 bath vacation rental cottage with full kitchen, private deck with hot tub, private garden, TV/DVD/VCR, WiFi, phone, reserved parking, dining room and attached greenhouse/solarium. Quaint studio vacation rental with a private entrance, gated patio, full kitchen and bathroom, located one block from historic Humboldt County Fairgrounds and four blocks from downtown Ferndale. An eclectically charming 2 bedroom, 1 bath vacation rental with a private backyard, located a block from Main Street. Sleeps up to 4 people. Amenities include a fireplace, cable TV, and DVD player. Two night minimum stay. Located on a 10-acre private estate overlooking Ferndale and the Eel River Valley, Ye Olde Danish Inn offers two cozy and secluded suites, each with its own private balcony.